Instagram has more than 700 million users, which makes it a perfect channel to showcase your talents to potential clients or employers. In the beauty industry a picture is worth a thousand words! In today’s digital world it is not uncommon for a client to come in with a picture of a hairstyle, hair color, or makeup look already saved on their phone to show their stylist. 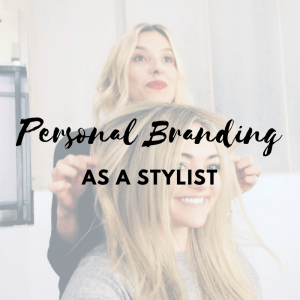 So, whether you are currently attending cosmetology school with plans to become a future stylist, or out working in the industry – Instagram is the perfect platform to establish your personal brand as a stylist. 1. Use targeted hashtags. Using hashtags for your posts will help you reach new audiences. For every post, include several relevant hashtag that highlights the features of your service. 2. Before and after pictures. This is the bread and butter of a stylist’s Instagram account. Taking the before picture is SO important because it shows exactly what type of transformation you are capable of. 3. Let your followers get in on the action. Capture action shots of behind-the-scenes peeks at your work. Post photos or videos of your favorite tools and techniques. Being transparent is a great way to earn credibility with your audience. 4. Quality over quantity. Have GREAT photos. Take pictures in a well-lit spot, avoid flash, and mind the background. A colorful and busy background will take the focus away from the focal point (your beautiful work)! 5. Study. Look at other popular Instagram feeds in the beauty industry. What makes their photos stand out? Is it something you could incorporate into your photos? 7. Water Marking. Little “brand marks” are a great way to keep your photos from ending up on another page – this way if someone shares your work, your personal brand is still on the photo. Water mark your photos with your name, social handle, or personal logo – just remember to keep it small so it doesn’t take away from your photos. Showcasing your talent and creativity will encourage your clients and followers to book an appointment with you! Get started building your personal brand, and don’t forget to put a #filter on it!